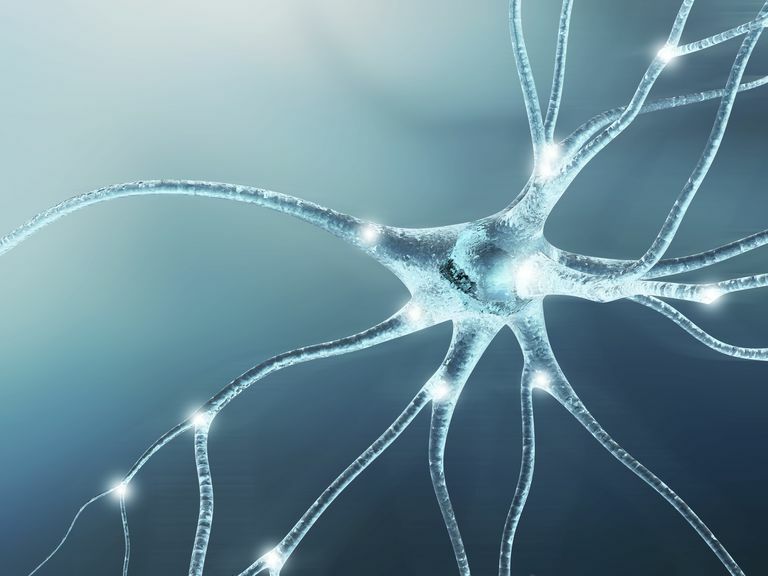 How do neurons transmit signals throughout the body? One part of this transmission process involves what is known as an action potential. An action potential is part of the process that occurs during the firing of a neuron. During the action potential, part of the neural membrane opens to allow positively charged ions inside the cell and negatively charged ions out. This process causes a rapid increase in the positive charge of the nerve fiber. When the charge reaches +40 mv, the impulse is propagated down the nerve fiber. This electrical impulse is carried down the nerve through a series of action potentials. When a neuron is not sending signals, the inside of the neuron has a negative charge relative to the positive charge outside the cell. Electrically charged chemicals known as ions maintain the positive and negative charge balance. Calcium contains two positive charges, sodium and potassium contain one positive charge and chloride contains a negative charge. When at rest, the cell membrane of the neuron allows certain ions to pass through while preventing or restricting other ions from moving. In this state, sodium and potassium ions cannot easily pass through the membrane. Potassium ions, however, are able to freely cross the membrane. The negative ions inside of the cell are unable to cross the barrier. The cell must activity transport ions in order to maintain its polarized state. This mechanism is known as the sodium ion pump. For every two potassium ions that pass through the membrane, three sodium ions are pumped out. The resting potential of the neuron refers to the difference between the voltage inside and outside the neuron. The resting potential of the average neuron is around -70 millivolts, indicating that the inside of the cell is 70 millivolts less than the outside of the cell. When an impulse is sent out from a cell body, the sodium channels open and the positive sodium cells surge into the cell. Once the cell reaches a certain threshold, an action potential will fire, sending the electrical signal down the axon. Action potentials either happen or they don't; there is no such thing as a "partial" firing of a neuron. This principle is known as the all-or-none law. This means that neurons always fire at their full strength. This ensures that the full intensity of the signal is carried down the nerve fiber and transferred to the next cell and that the signal does not weaken or become lost the further it travels from the source. So what happens inside the neuron after the action potential has taken place? After the neuron has fired, there is a refractory period in which another action potential is not possible. During this time, the potassium channels reopen and the sodium channels close, gradually returning the neuron to its resting potential. Once the neuron has returned to the resting potential, it is possible for another action potential to occur and transmit the signal down the length of the axon.